Palestinian cartoonist Mohammad Sabaaneh has quickly garnered domestic and international attention for his unabashed depictions of the Israeli-Palestinian conflict. Despite accusations of inciting hatred with negative portrayals of Israelis and a five month sentence in an Israeli prison on charges of “contacts with an enemy organization,” Sabaaneh sees his work as an opportunity to reflect in a non-violent way upon the day-to-day violence both Israelis and Palestinians face. His caricatures are not subtle. 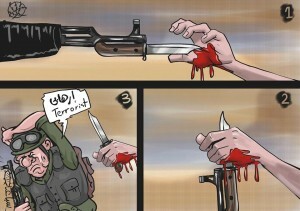 Israeli soldiers are depicted as goons. Palestinian kids are often shown as rebellious scamps, as if drawn from the pages of “Dora the Explorer,” firing their slingshots at colonialist oppressors. Palestinian women are pure. Palestinian elders are wise. Palestinian girls who throw rocks are cool. Jewish settlers are armed, ugly, dangerous. It probably comes as no surprise that Jewish Israelis and Sabaaneh’s Palestinian audience can look at the same cartoon and see very different things. These differences in viewpoint, though, have made him one of the most controversial cartoonists in the region both in Israel and Palestine. “I’ve been on the Hamas blacklist since 2008,” said Sabaaneh. He also faced questions from Palestinian Authority President Mahmoud Abbas earlier this year for his an alleged depiction of the Prophet Mohammed in a cartoon for the Palestinian newspaper, Al-Hayat Al-Jadeeda. Despite being paid less than the cost of pack of cigarettes for his cartoons, Sabaaneh continues to draw and views his work as an important contribution to the discussion of the Israeli-Palestinian conflict. You can view many of his cartoons at the Cartoon Movement website here.